When the cravings hit for something comforting, hearty, and full of flavor, we have the perfect dish for you! 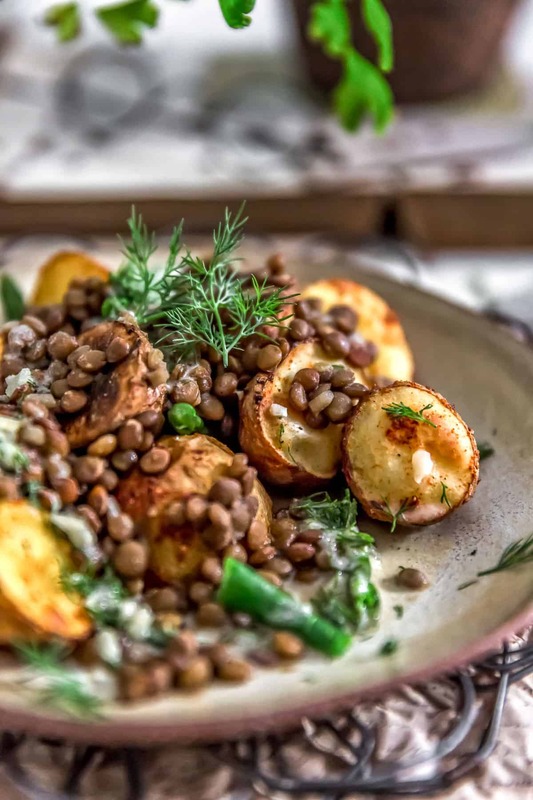 Crispy oven roasted baby potatoes coupled with deliciously seasoned lentils and topped with a tangy, fresh dill sauce is a dish made of dreams. 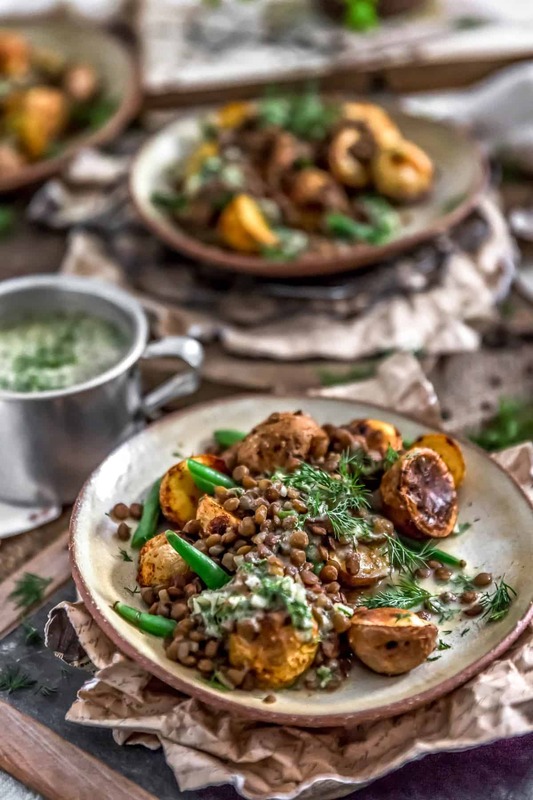 Be prepared to experience a new level of yumminess with the first bite of this amazingly scrumptious Oil Free Roasted Potatoes with Seasoned Lentils and Dill Sauce. 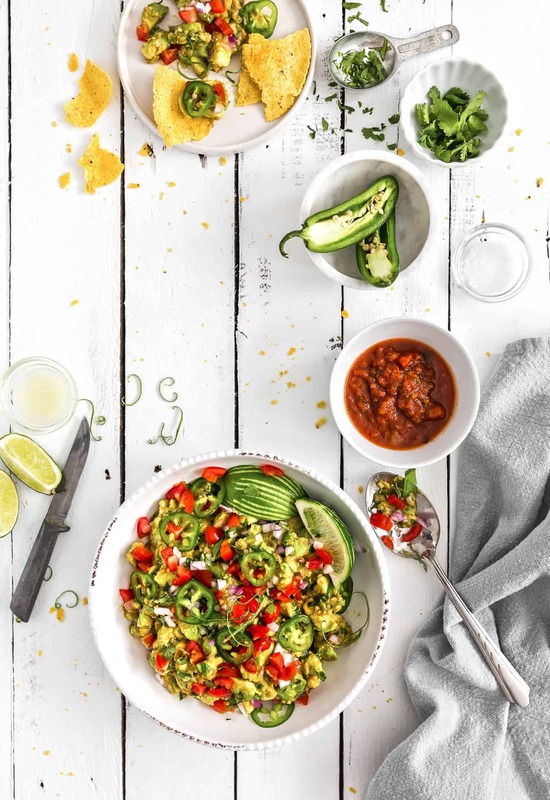 Served hot or at room temperature, it’s absolutely AH-MAZING and sure to have everyone running back for seconds! Whole Food Plant Based, vegan, plant based, oil free, refined sugar free, gluten free, no highly processed ingredients. 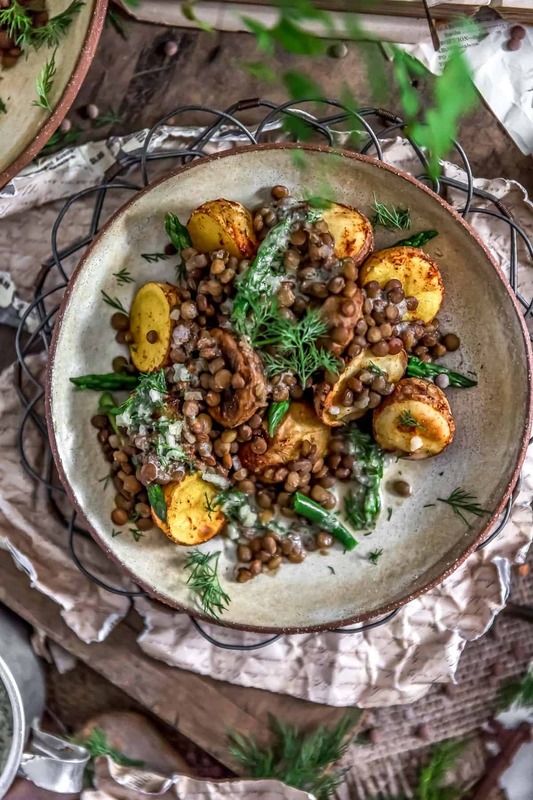 At our home, we are calling this Roasted Potatoes with Seasoned Lentils and Dill Sauce recipe “a dish of dreams,” simply because we can’t get over how great it is. I know, that sounds so weird, but we nailed this one with the first try (we usually kitchen test a number of times), but this turned out soooo good in our first kitchen test that we simply didn’t think we could improve upon it much more. We eat a lot of lentils, do you? Our favorite lentil is the small brown Pardina lentil also known as the Spanish brown. We have never been able to find them in stores so we buy them from Palouse Brand on Amazon. You can also buy them directly from Palouse Brand. Palouse Brand has an amazing small brown lentil. The Pardina is a smaller lentil, but what we love about them is they have this beautiful nutty flavor and they hold their shape really well after being cooked. I love that. 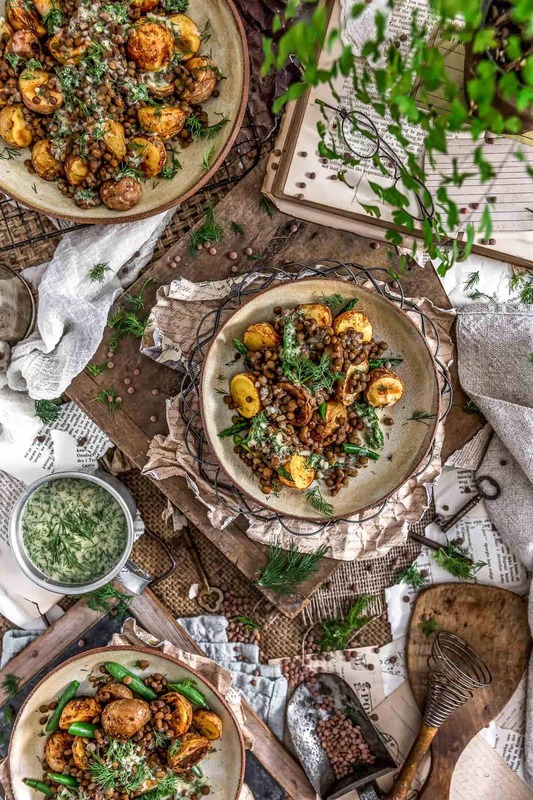 If you have never tried Pardina lentils (small browns), then we strongly suggest you give them a try as I guarantee you will not be disappointed. They are soooo gosh darn tasty and the texture is a thing of beauty. And just to clarify, this is not a sponsored advertisement, we just love those Pardina lentils that much that we want you to experience their goodness too! The dill sauce that Mom and I created just sends this dish over the top. At first we were worried that it has too much tang, but once you place it over the potatoes and lentils, it just has the perfect blend of tang ratio to lentils/potatoes. We just know you are going to love it. If you enjoy dill, then you will really love this sauce. 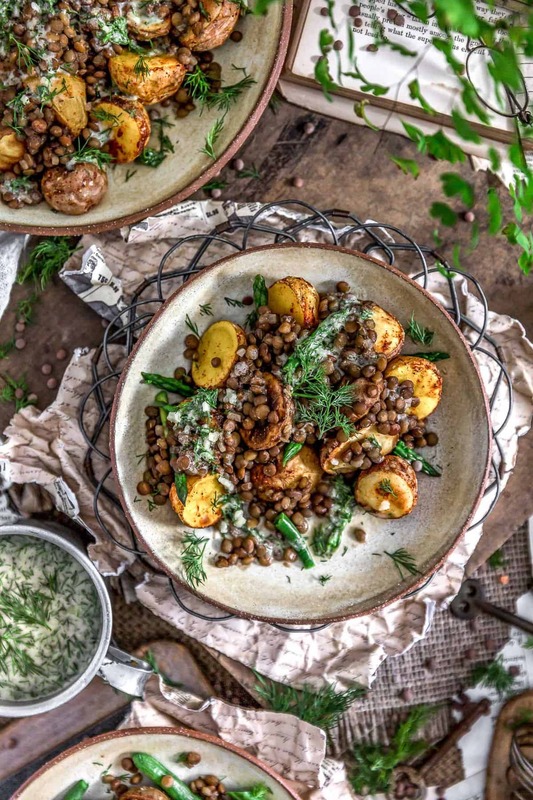 You may see some beautiful cut green beans or asparagus tucked around these lovely lentils and potatoes. One dish has blanched green beans and the other has asparagus, we just couldn’t decide; they both added a delicious fresh, crisp veggie flair to the dish. 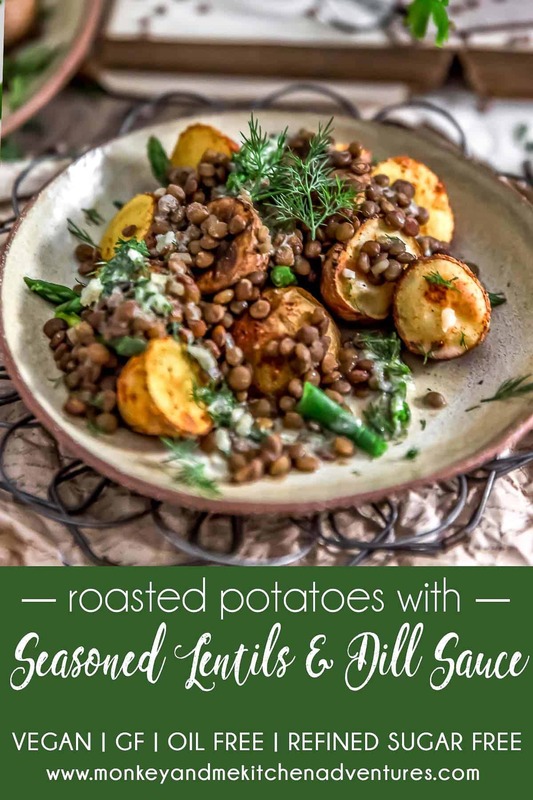 The dish totally holds on its own with potatoes, lentils, and sauce, but we really enjoyed that added veggie element – YUM! Our little Charlotte was feeling a little under the weather, but she was all about seeing what Grandpa Tony was eating on his plate. He was literally licking the plate so there wasn’t much to see by the time he got done. HAH! TP gave this recipe nearly perfect scores. The only thing he offered is that he really enjoys “boiled baby potatoes” rather than oven roasted. You could totally swap out the roasted potatoes for boiled potatoes, but we enjoyed the extra flavor that comes from the oven roasting potatoes and we think our Readers would too! 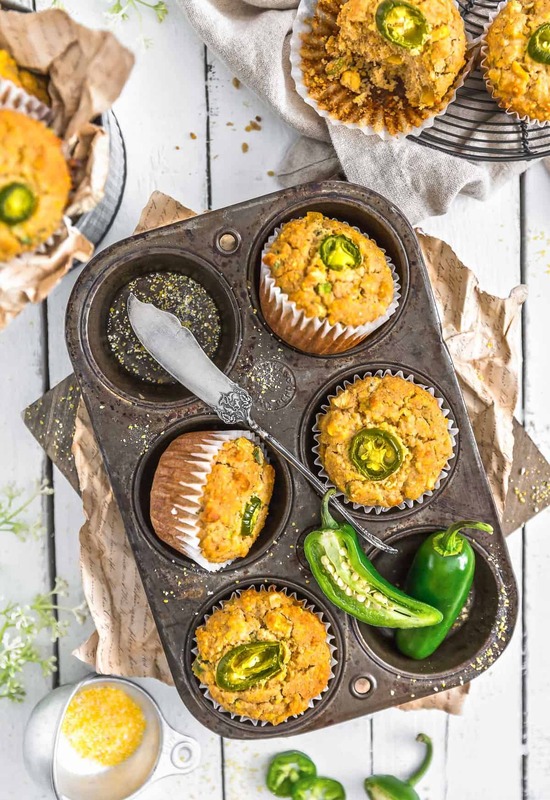 We would love for you to try this recipe! Place the rinsed lentils into a pot, cover with 4 cups of water and ½ cup of vegetable broth. Bring the mixture to a boil, then lower to a low boil/simmer. Add the onion powder, garlic powder, dried minced onion flakes, ground mustard, sea salt, and pepper. Stir to incorporate. Simmer for approx. 35 to 40 minutes just until the lentils are tender. Do not overcook. Watch them closely toward the end, about the 30 minute mark. You want the lentils to be perfectly tender while still holding their shape and not mushy. Note: If there is any left-over liquid after cooking the lentils, drain it off. Or when you remove the lentils from the heat and allow them to sit in the liquid, they will pretty much absorb any left-over liquid. Line a large baking sheet (or 2 small ones) with parchment paper, set aside. Place the dry seasoning into a small bowl, mix well, set aside. Wash and cut the baby potatoes in halves (or quarters if large) and place in a large bowl, then sprinkle the dry seasoning mix all over the potatoes and stir to coat well, then place in a preheated 400 F oven for 35 to 45 minutes until tender. 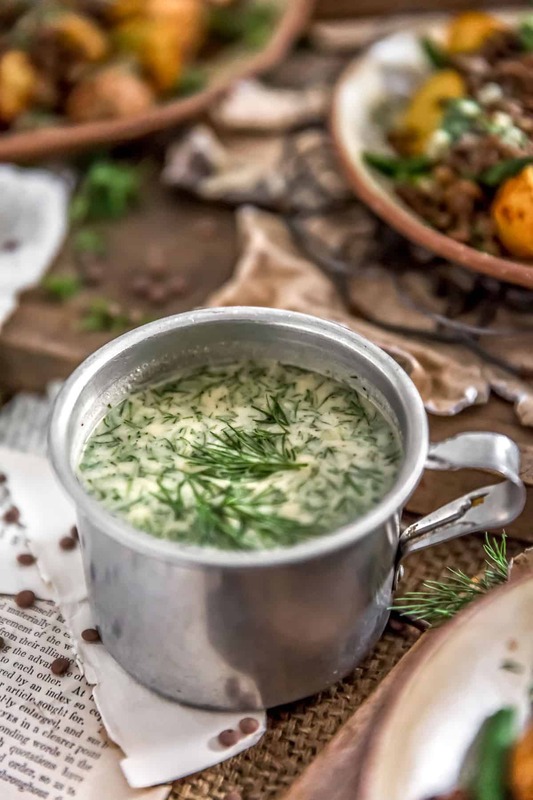 Place all the dressing ingredients (except the dill) into a small bowl, whisk well to incorporate, then add the chopped dill, stir to combine. Allow to sit for 4-5 minutes to marry the flavors. 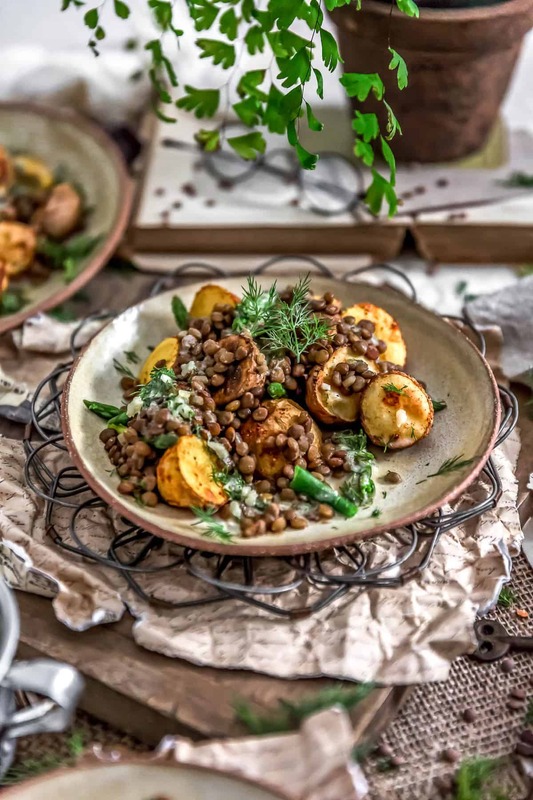 To plate individual servings, place a bed of roasted potatoes, then add a scoop of the seasoned lentils (and blanched green beans/asparagus – if used), then top with a generous amount of Dill Sauce. *Vegetable Stock: We use Pacific Organic Low Sodium Vegetable Stock. We love this brand because it is Whole Food Plant Based compliant, as it does not contain MSG, has no oil, and does not contain any highly-processed ingredients; however, this brand of vegetable stock does have a strong flavor so less broth is required when compared to the water ratio. We use a higher water to broth ratio because of this. If you are using a brand other than Pacific vegetable broth, then consider adjusting the water/vegetable broth ratio accordingly. For example, if you are using a very mellow vegetable broth, you might consider 3 ½ cups of vegetable broth and 1 cup of water for this recipe. Please adjust the recipe (broth/water ratio) accordingly based upon the vegetable broth brand used if using other than Pacific Organic Low Sodium Vegetable Stock. *Small Brown Lentils (Pardina/Spanish Brown): You can substitute any type of lentil for the brown lentils (other than red); however, you will need to adjust the cooking time. Small brown lentils typically cook faster than green lentils. We have found that the Small Brown Lentils works beautifully with this recipe. *Blanched/Cooked Green Beans: Fill a pot with water and bring to a boil, then place the cleaned green beans into the boiling water for approximately 1 to 4 minutes (or longer) – largely dependent upon how tender you prefer your green beans. Remove when the beans have reached the desired tenderness. Rinse them briefly in cold water to stop the cooking process. Serve. *Blanched/Cooked Asparagus: Fill a pot with water and bring to a boil, then place the asparagus into the boiling water for approximately 4 to 10 minutes (or longer) – largely dependent upon how tender you prefer your asparagus. Remove when the asparagus has reached the desired tenderness. Rinse them briefly in cold water to stop the cooking process. Serve. 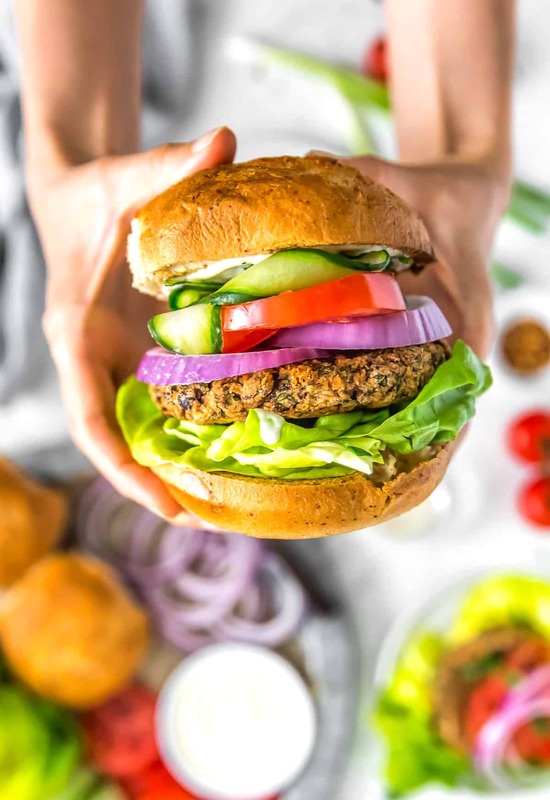 If you try this recipe, we would love to know if you love it as much as we do, we would love for you to leave us a review! I doubled the recipe, and served room temperature. Delicious. Awesome! We are so excited that you enjoyed this dish! Definitely a favorite on our Thanksgiving table! Thank you so much for taking the time to write! ..took the leftovers on greens to work …. it just gets better and better!! Love the recipes you guys post!!! WOO HOO, so thrilled that you enjoyed this dish! It is definitely a regular in our home. Thank you so much for taking the time to write such wonderful feedback! Can you do the lentil-potato dish in the instant pot? You could cook the lentil part in an instant pot, but we recommend roasting the potatoes for this dish. It adds such amazing flavor. 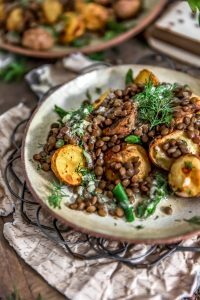 Plus, if you cook the lentil and potatoes together in an instant pot, you’d end up with a soup consistency, and this dish really requires all the different layers and textures. Hope this helps! Happy cooking!